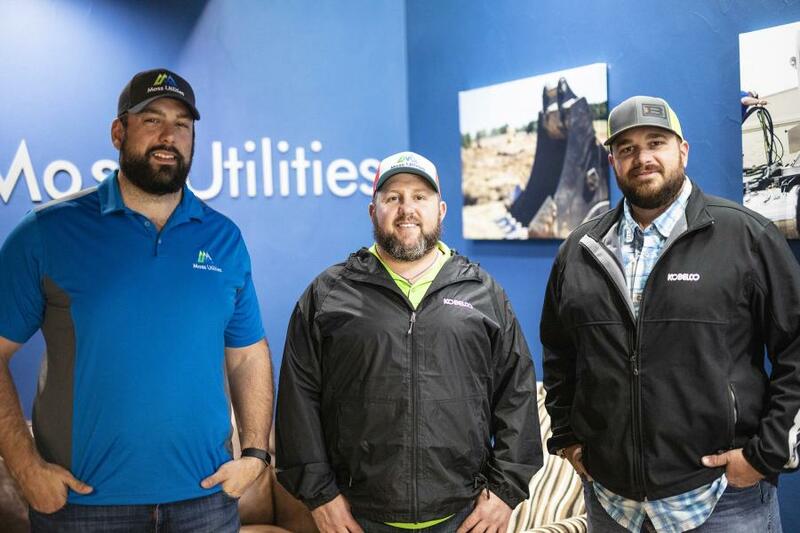 In 2016, Garrett Moss, fifth generation, along with Case Whitfield, decided to start Moss Utilities with the goal of continuing the family legacy of excellent workmanship, a passion for the industry and conducting business with honor and integrity. Moss and Whitfield needed an equipment supplier to help kick-start their new business. They had considered other local equipment dealers, but had a past relationship with Bane Machinery and heard positive things about Kobelco excavators. "My family has worked with Kobelco excavator dealer, Bane Machinery, since the early 1990's," said Moss, president, Moss Utilities. "When we decided to restart the Moss business, we reached out to the team at Bane Machinery to form a relationship with the fifth generation. They have been one-hundred percent supportive from the get-go." (L-R) are Garrett Moss and Chase Whitfield of Moss Utilities, and Clifton Place of Bane Machinery. Bane Machinery agreed to partner with Moss Utilities as their leading equipment provider — and the rest was history. Moss Utilities began to build a Kobelco excavator fleet, contracted several projects and quickly developed a name for themselves. Within two years, Moss Utilities grew from a business of four employees to a team of more than 140. 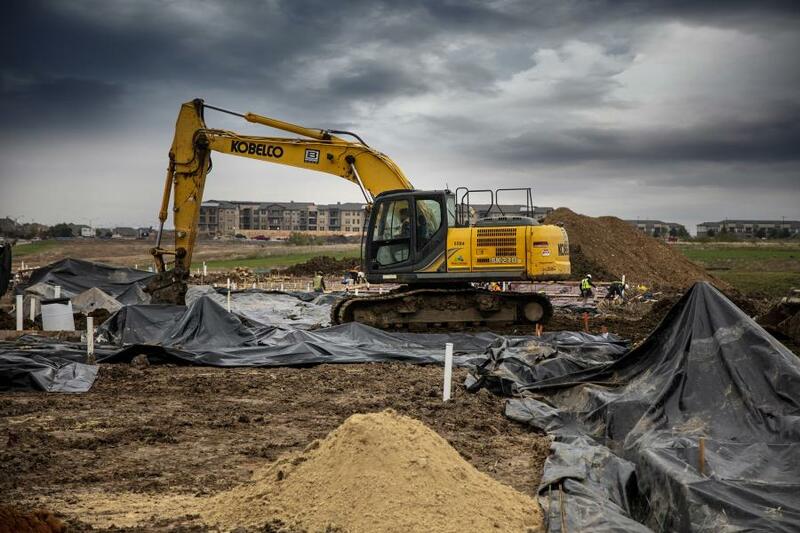 Today, the company specializes in providing its loyal customer base with underground utility installation services including water, sewer, storm drainage, duct bank and fire lines. A second business, Moss Excavation, also was founded to provide site excavation services on commercial, multi-family and subdivision projects. "The Moss team genuinely cares about the work that they perform, the machinery they perform it with, and the relationships they gain along the way," said Clifton Place, outside sales representative of Bane Machinery. "They really like having Kobelco excavators on their projects. They've used competitive models before, but always come back saying that the Kobelco machines boost productivity on the job and get it done much more efficiently." A majority of the construction equipment in the Moss fleet was purchased from Bane Machinery, 15 of which are Kobelco excavators. In order to meet the needs of its customers, Moss Utilities owns a variety of Kobelco models including many full-size conventional excavators as well as compact and short radius models. "The Kobelco machines take care of business," said Whitfield, vice president, Moss Utilities "Our guys are always surprised once they step into the cab of a Kobelco if they haven't run one before. Kobelco excavators are extremely efficient, powerful and smooth to operate. We like everything about them." Michael Hickerson, district business manager of Kobelco USA said, "It has been great working with Bane Machinery and the Moss team. Moss Utilities is a growing company that has a lot of visibility in the DFW area due to the size of its jobsites. From excavating to hammering rock, Moss tackles any application with their large Kobelco fleet. The partnership between Bane Machinery and Moss Utilities shows the broad range of machines and uses for the Kobelco excavator line." Moss Utilities plans to continue expanding itsbusiness and purchasing additional equipment and Kobelco excavators from Bane Machinery. "Our partnership with Bane Machinery allows us to do other things that we couldn't do with some of the bigger guys in town. We have a strong relationship and history with the Bane team. They are our go-to for machinery, parts and service and we look forward to continued success together," said Moss. Kobelco Construction Machinery USA offers industry-leading crawler excavators in the 3,000 lb. to 245,000 lb. 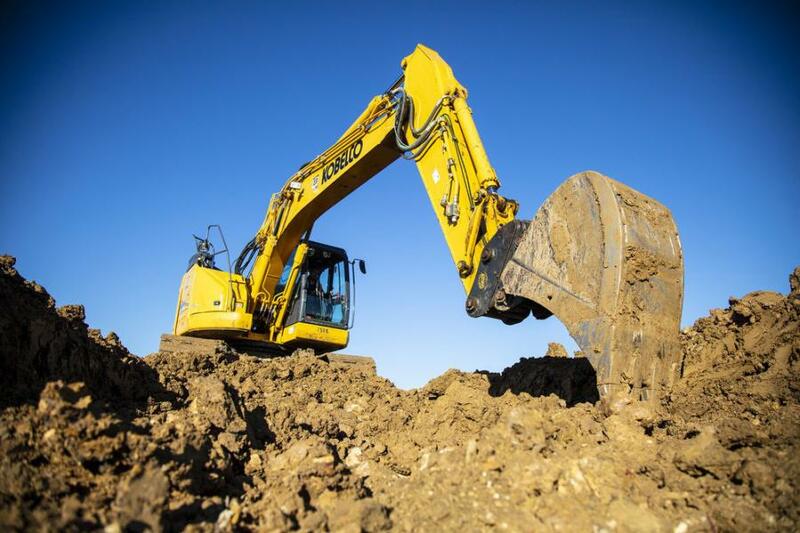 classes including zero tail swing, compact, standard, long-reach, mass excavation and demolition models. Well-known as the excavator authority, Kobelco is committed to producing quality machines with advanced productivity-boosting features and innovative technologies. With premier capabilities such as no time limit power boost and exclusive independent travel, Kobelco machines ensure superior performance and efficiency for the toughest worksite challenges. For more information, call 281/888-8430 or visit KOBELCO-USA.com.